Windows 10 backup and restore functions is still a matter of nearest future at early 2015, because the Windows 10 technical preview is constantly modernizing. Which solutions will be approved as the final is still a matter of some speculations. Users have suggestions that the native Windows 10 backup instrument will be the same as in Windows 8, i.e. the “File History” tool. This instrument can provide backing up single files and, perhaps, folders, but not a massive, planned saving of crucial data or Windows 10 backup image. Presently, this tool is non-operational due to bugs and still goes under construction. Therefore, third-party software, such as ever-popular Handy Backup, may be successfully used for greatly expanding the Windows 10 backup and restore capabilities. Instead of saving some chosen files locally or at the dedicated cloud service, it opens a vast opportunity for backup strategies! Why I Need Specialized Software for Windows 10 Backup? Windows 10 contains many functions and settings, so it seems much more reasonable to trust the specialized utility for backing up the OS, instead of saving copies of important data manually or through different scripts. 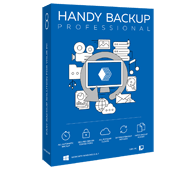 Handy Backup is a paragon of these utilities, fully compatible with Windows 10. Note: Using Handy Backup, you can try Windows 10 without spoiling any of your current Windows data. Just use the Disk Image tool or Disaster Recovery utility for creating both Windows 10 backup image and the image of your current system drive or partition, and install which of both your need. Handy Backup can provide some significant advantages for Windows 10 backup and restore. Some of these advantages and features are listed below. As Windows 10 is declared to be oriented to online storages and services much more than for “traditional” off-line (local) resources, Handy Backup provides Windows 10 backup to almost any online storage existed for now. They include Amazon S3, Google Drive, Dropbox and, presumably, OneDrive! Handy Backup is capable to save copies of any single data type existed automatically, including user-defined files and folders, Windows libraries, registry, website or cloud content, SQL-based and other database engines. As well as to copy exactly the image of disks or partitions. By default, all data copies made by Handy Backup are stored in the data native formats, allowing using these data immediately or mirroring datasets without extra efforts. User can also encrypt and compress the information backed up, move it via SFTP/FTPS secured protocols, restore it to other place and so on. This is no backup strategy that cannot be realized by Handy Backup. It allows user to schedule any single task for repeated periods from months to minutes. Also to run it as Windows service requiring no interference, to start other programs before and after the task, and to notify user of any action. Try backup software Handy Backup Professional, fully compatible with Windows 10 and other Windows operating systems. Free 30-days trial version ! Extremely wide compatibility with other OS Windows editions, including Windows 8.1, 8, 7, Vista and XP, as well as server solution like Windows Server 2016, 2012/2012R2, 2008/2008R2 and 2003. In network-oriented editions, some distributives of Linux are also supported. You may try Handy Backup freely for 30 days, using it with your newest Windows 10 technical preview, to explore all the might of this useful Windows 10 backup software!